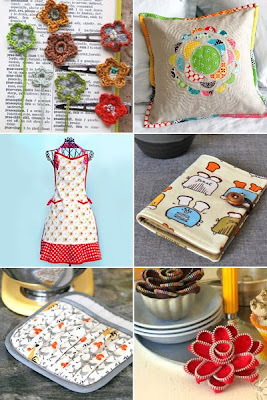 I read today on this really great blog How About Orange this sssoooo cute post on handmade things. It's all about DIY tutorials and you know that I'm a big fan of tutorials. Don't you just love them!! I want to make them all. I will definetely have to add the applique pillow on to my to make list. ps I would love to know which one is your favorite!! I am totally loving the vintage style apron, but i enjoy all of them, nice finds! That apron is pretty! So is that pillow!